With the Summer Olympics fast approaching, this month’s Nonprofit Blog Carnival host – Craig Linton (Fundraising Detective) – wanted submissions about memorable Olympic moments that have provided inspiration. I’m always amazed by the power the Olympic games have to draw in even non-sports fans (like me) and to stir our sense of pride and patriotism. 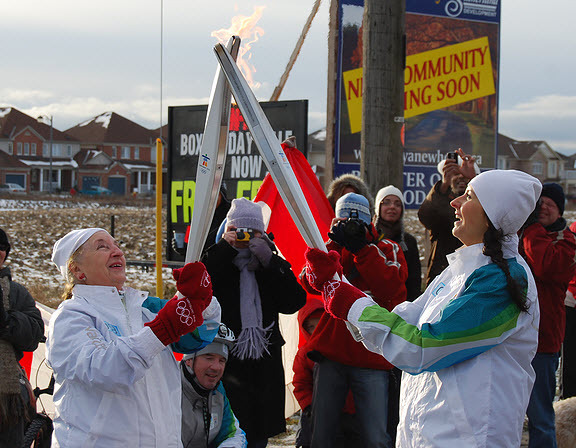 And while I remember many wonderful gold medal moments, the most iconic symbol for me is the Olympic torch relay. As a Canadian, I followed the media coverage of the torch passing procession leading up to the 2010 Winter Games in Vancouver. This involved a 106-day journey where the torch was carried by Canadians from all cultural backgrounds across Canada. For me, the passing of the torch symbolizes the Olympics' ability to bring together people from all ages, races, cultures and countries for a common purpose. We can draw many similarities between the passing of the Olympic torch and the passing of the baton (or gavel) from one volunteer to another. In fact, I used that analogy a post I wrote a while back about volunteer transitions. When board members, event organizers and other key volunteers leave and new volunteers come on board, there can be many challenges involved with passing the volunteer torch. These challenges with volunteer transitions can range from broad strokes, such as orientation of new Board members, to more detailed issues around information and resources transfer. For example, I’ve heard stories of incoming volunteers trying to find misplaced logos or artwork to promote a yearly event and realizing they’d have to be recreated from scratch because no one knows where they were stored. It seems that smooth volunteer transitions can be derailed by a lack of pre-planning, ineffective processes and poor resource management. Along with effective orientation processes, manuals and resources, it’s also important to have systems in place to maintain your “institutional memory” such as your membership or supporter database, event registrants and other data that needs to be safely stored and backed-up to ensure continuity. Depending on your needs and the size of your organization, this might mean creating Google docs, or using Membership Management Software, both of which can be accessible to multiple individuals – in the Cloud. To relate this back to our Olympic theme, I’m sure there are many different techniques that athletes develop to ensure effecitve handing off the baton in a relay race or in passing the Olympic torch. In the same way, each organization needs to develop volunteer management and transition processes that suit their unique needs. But it's important to bear in mind that when you have new, keen volunteers standing ready to grasp that torch and run with it, you want to be sure you have the information and processes in place to ensure that individual's success as well as their sense of achievement for both him/herself as well as your organization. The torch will soon be lit in London signalling the start of the Summer Games. I’ll be tuning in to keep an eye on my country’s Olympians and hoping for some Gold Medal moments. Enjoy the games!